The region from which many of the world’s staple foods derive is under threat. LONDON, Nov. 7, 2016 – If nations fail to limit global warming to 1.5°C this century, at least one region of the globe will experience change not seen in the last 10,000 years. Temperatures in the Mediterranean basin are already 1.3°C higher than they were between 1880 and 1920. If they go on getting much hotter, there will be change on a scale not seen since the close of the last Ice Age, according to a new study. Under the notorious business-as-usual scenario, in which humans go on burning fossil fuels at an ever-increasing rate, and releasing ever more carbon dioxide into the atmosphere, then the dunes of North Africa’s Sahara will march northwards and southern Spain will become a desert. Deciduous trees will invade the mountain regions, and shrubland vegetation will replace the great deciduous forests in large areas of the Mediterranean, according to two scientists from the Universities of Aix-Marseille and Avignon in France. Joël Guiot and Wolfgang Cramer report in the journal Science that they sifted the evidence from pollen cores and other telltale climatic indicators and modelled the pattern of ecosystem change through the Neolithic, the Bronze Age and recorded human history. 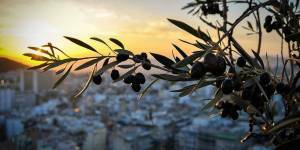 The Mediterranean plays a powerful role in the human story: some of the world’s great staples – wheat and barley, olives and figs, lentils and pulses – were domesticated near its shores. Cattle, sheep and goats were tamed, and yoghurt and cheese first appeared there. Mediterranean peoples learned to ferment wine and beer, forge tools with metals, create three of the world’s great religions, and lay the foundations for much of the world’s theatre and literature, art and science. The Mediterranean Sea has been both a cockpit of conflict and the starting point for the creation of empires. But it is already changing as a response to global warming. The present drought in the eastern Mediterranean has been pronounced the worst in 900 years. Warmer temperatures have brought invader fish from the Red Sea and driven the sardines out into the Atlantic. The woodland and scrub along the coast have always been vulnerable to fire, but the fire season in the region has been extended so far by 29 days. There have been fears that, unchecked, heatwaves amplified by global warming could make some places uninhabitable. And prehistory has its own lesson: there is evidence that at least one ancient civilisation may have been toppled by climate change. Nations that met in Paris last December vowed to contain global warming to within 2°C overall, and if possible to 1.5°C. But that is a global atmospheric average temperature: in fact, some parts of the planet have already exceeded that. And vows are not to be confused with action. As nations prepare to meet again in Marrakech, in the Mediterranean nation of Morocco, the two scientists from the south of France have delivered another urgent warning. They foresee a period characterised by what they politely called “recurring precipitation deficits”: in other words, sustained and potentially catastrophic drought. In this scenario climate change threatens the crops of the region, the creatures that live there, and the tourist industries that thrive on its climate and history. And, the two scientists warn, the changes they predict will be entirely a consequence of warming.